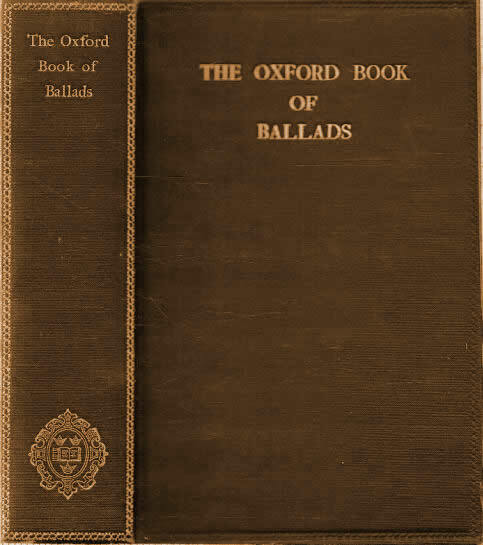 AS IN The Oxford Book of English Verse I tried to range over the whole field of the English Lyric, and to choose the best, so in this volume I have sought to bring together the best Ballads out of the whole of our national stock. But the method, order, balance of the two books are different perforce, as the fates of the Lyric and the Ballad have been diverse. While the Lyric in general, still making for variety, is to-day more prolific than ever and (all cant apart) promises fruit to equal the best, that particular offshoot which we call the Ballad has been dead, or as good as dead, for two hundred years. It would seem to have discovered, almost at the start, a very precise Platonic pattern of what its best should be; and having exhausted itself in reproducing that, it declined (through a crab-apple stage of Broadsides) into sterility. Therefore this anthology cannot be brought down to the present day, and therefore the first half of it contains far finer poetry than the second.